Yet another discovery has been brought into the growing pile of evidence that suggests Neanderthals were not quite the savage, hairy monsters we often portray them as being. Recently the fossil evidence has shown that they were attentive parents, that they had an appreciation of art – creating cave paintings of their own, and that they held elaborate burials for their dead, but a new study elaborates a bit further on their personal tastes. According to a paper published today in PLOS ONE, the Neanderthal hominids may have developed their own jewelry – necklaces fashioned from eagle talons, that until recently were attributed to modern humans. They disappeared some 39,000 years ago, shortly after modern humans began to enter Europe – for reasons that are not quite known. For some time before their extinction, the species are believed to have interbred, and perhaps they did not so much die out as become assimilated with homo sapiens. Our DNA is 99.7% identical to theirs, and modern humans who aren’t of African descent share about 2.5% of DNA with Neanderthals. Although this lineage has recently fallen into dispute, both Neanderthals and modern humans did originate in Africa, and may have shared a common ancestor. Not only did they craft jewelry, but their hunting skills may have rivaled those of modern humans as well. In order to craft the talon necklaces which seem like a necessary ingredient in most movies featuring prehistoric cavemen – they may have also been able to fashion traps to catch more than one eagle – at that time the sky’s apex predator. The evidence came not from a recent archaeological dig, but rather through examining some old articles from a museum collection. (as so much evidence does) from the bowels of a museum collection. At the beginning of the 20th century, Croatian paleontologist Dragutin Gorjanović-Kramberger lead an excavation of a site near the Croatian village of Krapina, which was filled with Ice Age human and animal remains. While you may have never seen Gorjanović-Kramberger’s name in print before, during his career, he used newly invented X-ray machines to look at inner bone structures from his finds and he even developed a way to determine the ages of the skeletons he found, through analyzing their fluorine content, nearly half a century before carbon dating came into existence. The site he uncovered held almost a thousand human bones, the bones of several thousand animals, several thousand animal bones, alongside at least a thousand tools, all of which dated between 120,000 to 130,000 years ago. As a result, the town is now home to a large museum dedicated specifically to Neanderthal culture and evolution. Like most modern paleontologists, Gorjanovic-Kramberger kept a detailed record of where each skeleton was found, but when it came to discovering the necklaces, he overlooked something rather obvious. The bird specialist in Budapest also paid little attention to the talons as did the museum curators who kept the specimens stored in their collection for well over a century. It was not until late 2013, when one of Frayer’s colleagues became curator of the Croatian Natural History Museum and gave the talons a second look. She gave him a call after she suspected that the markings had been made by the Neanderthals they were buried with. The single most important detail is the age of the necklaces. They are 120,000 or 130,000 years old, when Croatia was occupied solely by the Neanderthals. Researchers have in the past suspected that Neanderthals did craft the necklaces, but may have learned their trade from what were much more sophisticated homo sapiens. The only prototypes they had for this claim, were more modern necklaces found in France, dating to about 40,000 years ago. The patterns of wear of the talons have led Frayer and his colleagues to believe that the claws had been strung together and were worn as necklaces. Exposure to sweat as well as other bodily fluids led to a distinct type of polishing which is often found on shell bead necklaces made in the same way. Eagles would be rare in the mountainous terrain where the Neanderthals lived, and were also highly aggressive, two aspects indicating that these Neanderthals were highly skilled when it came to hunting. These were not run-of-the-mill prey – they were targets that some of the braver Neanderthals deliberately hunted. It took about three or four birds to make one necklace. 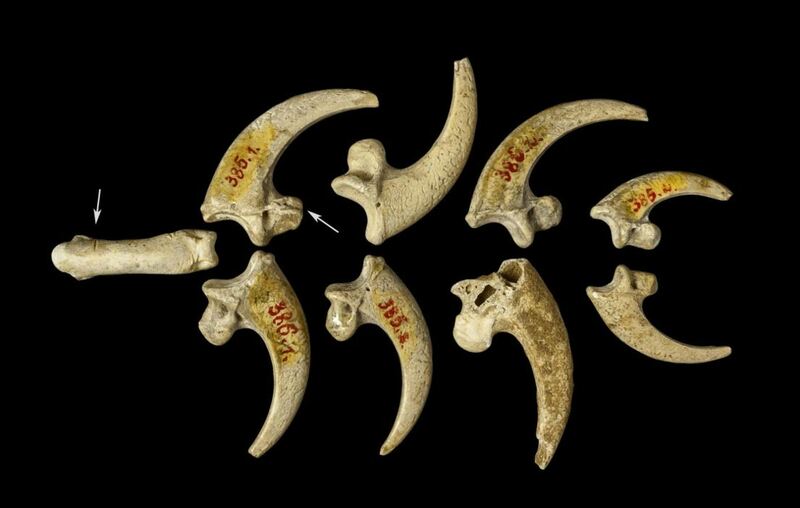 Even the decision to use eagle talons as an ornament — if it really was intended for that — may also suggest that the Neanderthals had capacity for abstract thinking. “When you catch the most powerful aerial predator in your environment and wear it around your neck, that suggests some kind of attempt to get its power,” he said.